People have relied on weapons to advance both their best and worst impulses—to put food on the table, to protect themselves, to enforce or defy the law, to defend or conquer territory and treasure, or to liberate some while enslaving others. This exhibition features weapons and accoutrements from the Virginia Historical Society’s collection crafted in Virginia or used by its people to achieve those goals. Although these weapons may seem primitive to us today, all of them reflect the best technology available at the time. Many are products of Virginia’s desire to modernize and industrialize in the century after the American Revolution. Most of these weapons demonstrate skilled craftsmanship in shaping brass, iron, steel, and wood. Some are works of art, while others are remarkable because of the inventiveness applied in pursuit of deadly designs. This exhibition and gallery are both made possible by the Cecil R. and Edna S. Hopkins Family Foundation. Portrait of John Page Hopkins (1825–1857), about 1835 1973.18, Bequest of Louise (Anderson) Patten Hopkins is shown here with his dog, hunting bag, and powder horn. 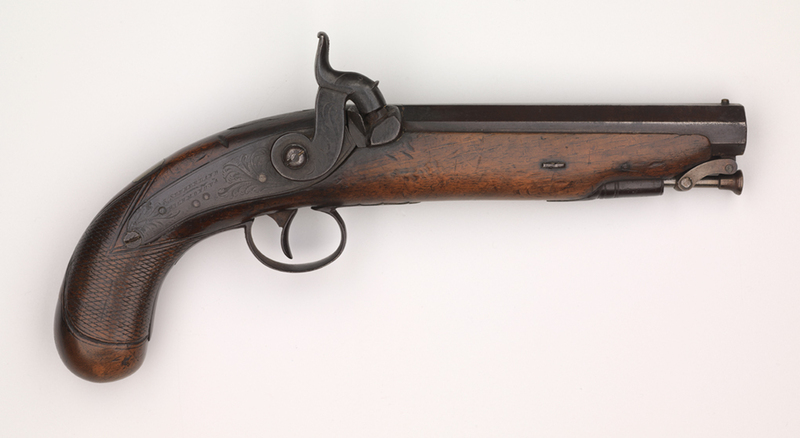 Half-stocked in maple, his sporting rifle has been altered to a percussion lock but retains the original flintlock flash pan. A native of Clarke County, Hopkins studied medicine in Philadelphia. In 1850 he earned a commission in the United States Navy and served as assistant surgeon on the USS Marion. He resigned in 1857 to become United States Consul to Tobasco, Mexico, where he died. Pocket pistol, Samuel Sutherland, about 1860 1990.100.11 Maryland Steuart Collection, Gift of Richard D. Steuart Deringer-type pistol, about .45 caliber, made by Samuel Sutherland. Sutherland operated a sporting goods store in Richmond before the Civil War and was actively engaged in altering and repairing firearms for the Confederate government. Cartridge box, William H. Horstmann & Sons, after 1828 1990.100.367 Maryland Steuart Collection, Gift of Richard D. Steuart Virginia struggled to quickly arm its volunteer soldiers in the early months of the war and many antiquated weapons and accoutrements from state armories were issued. 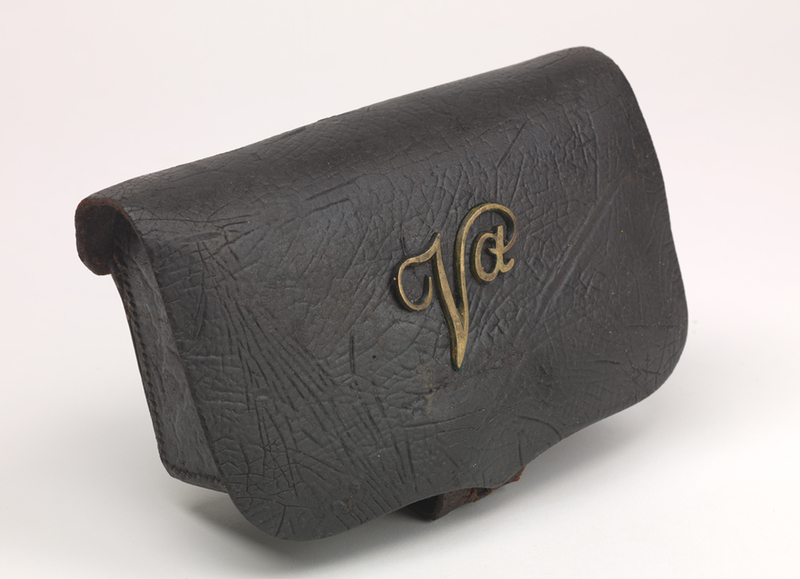 This pre-war militia cartridge box was issued to a member of the 52nd Virginia Infantry.